Chinese food in the United States has become as American as apple pie. Or crab Rangoon (which was probably invented here). Since its earliest days in the U.S., when it arrived with immigrants who came for the Gold Rush, Chinese food has been maligned ... but ultimately embraced and changed into the quintessential Americanized version that's popular on menus all over the country. On KCUR's Central Standard, our Food Critics searched out the best Chinese food in and around Kansas City. Sichuan Dynasty — crispy duckling. Served with pancakes. Sichuan Dynasty — yu xsaing pork. Made with minced pao la jiao (pickled chili), white scallion, ginger and garlic. The mixture is then fried in oil until fragrant, then water, starch, sugar and vinegar are added to create the basic sauce. Sichuan Dynasty — dry hot pots. Stir-fried peppers, onions and a protein in a sizzling wok. Sichuan Dynasty — Chung King spicy chicken. Sichuan Dynasty — pork dumplings. Steamed and served sitting in a garlic-soy chili sauce. It’s just delicious; the sauce gets soaked into the dumplings. Dragon Inn — sha cha chicken. The sauce is made with soybean oil, garlic, shallots, chili, brill fish and dried shrimp. It has a savory and slightly spicy taste. Dragon Inn — double sautéed pork. The pork is boiled, then sautéed with vegetables in a hot sauce. Red Snapper — house chicken. Served with shredded cabbage in a special garlic sauce. It's actually house beef, but I always ask for it with chicken and spicy. It’s just awesome. Red Snapper — san shan jam bong (spicy seafood soup). With noodles, shrimp, scallops, mussels. It has a Korean profile. Princess Garden — steamed dumplings. Served with black vinegar and spicy oil. Princess Garden — Hunan egg rolls. Much thicker and chock-full of pork, cabbage and spicy ingredients. I think they’re the best egg rolls in town. Princess Garden — Sichuan noodles. With pork, chicken and shrimp and a black bean sauce. Princess Garden — dry-cooked chicken with pancake. Similar to moo shu; served with hoisin sauce. Princess Garden — orange chicken. With broccoli and pea pods. This is the only Chinese restaurant I know that makes this dish with stir-fried chicken (rather than it being deep-fried). Princess Garden — harvest vegetables. With a ginger-garlic brown sauce. 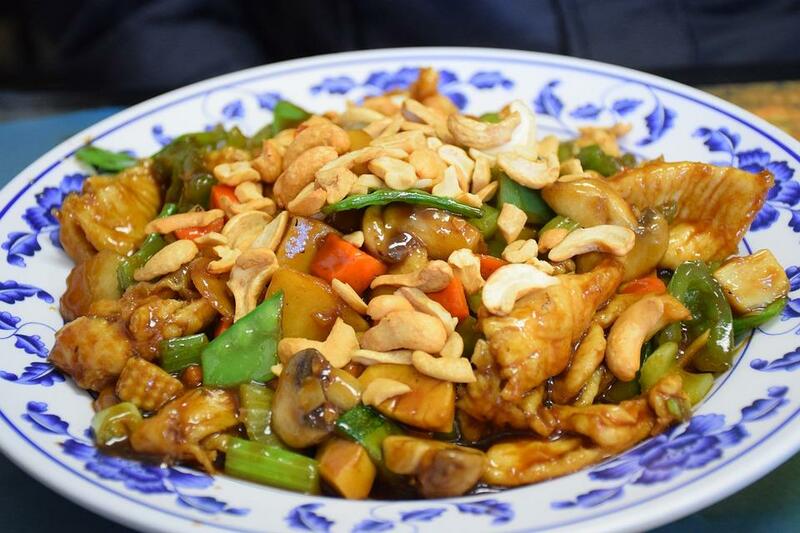 Blue Koi — chicken, bell peppers and mushrooms with black bean sauce. Blue Koi — Firebird Duck. Boneless roast duck sautéed with chili pepper, scallion and bamboo strips. Also available with chicken or tofu. Blue Koi. Comforting noodle and dumpling dishes. I also like their creative takes on Chinese classics, like their scallion pancakes and fried steamed buns. Bo Lings — daily dim sum menu. The variety of selections widens on the weekends. Kin Lin. The owners are happy to show guests the more “authentic” Chinese menu upon request. They have great Chinese dishes like braised pork belly with pickled mustard greens. Lucky Wok has a lot of traditional Chinese dishes, like braised sea cucumbers. Heiwa Asian Food in Gardner, Kansas. The owners can make dishes with a red paste of fermented rice lees, a childhood favorite of mine (grandpa used to make it). You have to call ahead to special order dishes cooked with this red fermented rice lees. Red Snapper — ying jang pe. It’s a Korean-ish dish with thin, broad transparent noodles served with a smattering of different things on top (like ground pork, julienned vegetables and more). They bring it to the table and toss it all together with a very spicy wasabi sauce. It sounds like a total train wreck, but it’s delicious. New Peking also has a version. Bo Lings. Still family-owned, excellent service, attention to quality. The current dynasty of restaurants owned and operated by Richard and Teresa Ng evolved from Teresa's family: the founders of the Dragon Inn in downtown Overland Park. ABC Café. Tasty, moderately-priced traditional Chinese dishes in a casual setting. Odd hours, but wildly popular. Princess Garden. The closest any Chinese-American restaurant in Kansas City comes to a 1960s restaurant, complete with a lengthy menu and an elaborate cocktail menu. Kosher-friendly dishes still offered here. Red Snapper – egg drop soup. My favorite, if I have to have it. It’s very, very light and flavorful. They also do nice things with fish. New Peking — house beef served on cabbage. No MSG and low salt. It’s delightful. New Peking — shrimp toast. New Peking — sizzling rice soup. Huge dish, enough for 2+ people. New Peking — Mongolian beef. I’m really picky with red meat, and they do it really well there. It’s stir-fried briefly and quickly, and served on a bed of crispy rice noodles. Chinese Buffet in KCK. Off 78th and State. Reasonably priced. The crab Rangoon is really great. Rainbow Restaurant — buffet. By Zona Rosa. Also reasonably priced. ABC Café. I think the food is incredibly subtle and delicious. I like the bok choy, and there’s a great fish ball soup. I also like the sticky rice (mixed with meat) that’s wrapped in a lotus leaf and steamed. China House in Lawrence. Has had the same owners since I was a kid. Some of the best American-style Chinese food. I like the pork fried dumplings and the pork fried rice is fantastic. When KCUR Food Critic Charles Ferruzza moved to Kansas City in 1984, there were “lots and lots” of Chinese restaurants, but very few Thai, Korean or Vietnamese places. “People have no idea what a plethora of options they have now,” he told host Gina Kaufmann on KCUR’s Central Standard. We’ve been eating out of bowls for thousands of years. However, the idea of serving meals in bowls has become trendy in the United States. And it's not for people who don't like their food to touch. “I think the bowl trend comes out of an idea of more healthy, mindful eating,” Jenny Vergara told host Gina Kaufmann on KCUR’s Central Standard. Bowl meals are also portable and convenient — and they’re also Instagrammable.